Click here to view historical pictures. The third (and second general) hospital to open its doors in Weston, at 501 Main Avenue on November 1, 1921, was The City Hospital, established by veteran physicians Edward T.W. Hall and William H. Greene, both recently returned from World War 1 military practice. From 1904 until 1919, Dr. Hall had operated a small hospital in his home at Freemansburg. Dr. Greene practiced at Camden from 1908 until April 1920, when he joined Dr. Hall in a joint practice. Their offices were in rooms in the Tierney Building. There they performed the first appendectomy in Lewis County's history. 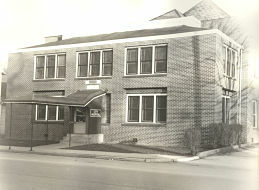 The Tierney Building was located at 135 Main. In 1958, Ralph M. Fisher and Edwin A. Trinkle sold The City Hospital facility to the newly incorporated and community-organized Stonewall Jackson Memorial Hospital, and the old City Hospital had a new name. It was located on Main Avenue, in Weston. The two physicians had acquired the City Hospital in 1938, and after World War II, substantially enlarged the building with a modern extension. The Economic Development Administration, under Gov. Arch A. Moore, awarded Stonewall Jackson Memorial Hospital $869,000 for construction of a new hospital building in the late 1960s. The total grant for the hospital up to this time was almost two million dollars. Groundbreaking for the new building took place in May 1970. In 1972, Stonewall Jackson completed construction of a new, 70-bed hospital on U.S. 33, at the western edge of the city. The $4,000,000 facility was considered to be one of the finest hospitals for its size in the country. It featured two operating rooms, two X-ray rooms, two labor rooms, one delivery room and 10 OB rooms. The parking lot accommodated 120 cars and 127 people were employed here. Emil Baldwin was administrator and Elden H. Pertz, M.D., was the Chief of Staff. The hospital offered physical therapy, inhalation therapy, and a coronary care unit. In 1979, Physician Office Building #1 was completed. The four-suite 6,000 sq ft building was constructed to recruit additional physicians to the area and give them a location near the hospital. Cardiac Rehab was also created that year. In 1987, the Intensive Care Unit was expanded. Four rooms were renovated and the walls were made of glass so that patients could be monitored. In April of that year, a ground breaking was held for Physicians Office Building #2. It opened in August. During this time, a permanent helipad for the hospital was constructed. Prior to this, helicopter landings were done on a section of the lower or upper visitors' parking lots. The need for a permanent pad arose when excess parking was used for the construction of the new Physician Office Building. In 1992 a new round of renovations took place and included: a new emergency department (expanding the number of beds from 4 to 7); additions to OR, ICU, lab, and radiology; new departments for outpatients, medical records, respiratory care, physical therapy, and library. The cafeteria was also enlarged at that time. Stonewall Jackson Home Care was established in 1996. This external department cares for patients who can be in their own home, but need the support of nursing personnel. Originally, the Home Care office was in Physician Building #1 but moved to Garton Plaza in 1997. (In 2008, the offices moved to Market Place Mall.) A 4-bed telemetry unit was established that year next to ICU. SJMH was named a Trauma Level III facility by the WV Dept. of Health and Human Resources Office of Emergency Medical Services. Dr. Charles Lively's medical practice was acquired by the Hospital and renamed Lively Health Care Center. In 1998, work began on the renovation of the Special Delivery Birthing Center, boardroom, classroom, and library. Ten new administrative offices were also added to the facility. When the work was completed in October of that year, the event was celebrated with a Healthy Kids Fair and Open House. SJMH purchased a tract of land located at the intersection of I-79 and Corridor H for construction of a new hospital building. In 1999, the WVU Emergency Medical Services surveyed the Hospital and gave SJMH an "Always Ready for Kids (ARK)" designation. Work began on a 150-place parking lot located behind the Hospital. JCAHO re-accredited the Hospital that year. The SJMH Skilled Care Unit was closed on Jan. 1, 2000. The large employee parking lot behind the hospital was completed during the summer. It greatly relieved the parking problems visitors and patients faced. The Hospital also sponsored the first Benefits Fair for SJMH employees. Dr. Mahmoud joined the practice of Dr. Husari. In March, BBL Carlton began renovations on the first floor of the Hospital. Two more beds were added to ICU to bring the total to six. A waiting room was added next to the Telemetry department. Dr. Alvaro Gutierrez joined the Weston Neurology Clinic, Dr. Salvatore LaNasa joined the SJMH staff in August. Dr. Tony Naim joined Dr. Murshid Latif's obstetrics/gynecology practice. Radiologists Dr. Wilson Tan and Dr. Felipe Espinoza began work at SJMH. Plans were begun for the 30th anniversary of SJMH's move to its facility on Rt. 33, west of Weston. Dr. Murshid Latif retired from his practice and relocated to his homeland of Jordan. Eighty women participated in the Free Women's Health Screening hosted by SJMH. JCAHO survey was held in August and the Hospital passed. A bone densitometer was installed in the Radiology Dept. Dr. Yousef Abdulnabi joined Dr. Sabbagh in his cardiology parctice. Cardiac Rehab was given certification for its program. A new hospital-wide computer system (CPSI) was unveiled. The Theresa Snaith Auxiliary celebrated its 40th anniversary. Long-time Board Member M. William "Bill" Adler passed away on Nov. 1. His death was a great loss to the Hospital. Nurse midwife Vicki Smith joined the practice of Dr. Tony Naim. Delegate Douglas Stalnaker joined the SJMH Board, filling the vacancy left on the Board after M. William Adler's death. A security system was installed in the Special Delivery Birthing Center. Dr. Muqdad Zuriqat joined the staff of Dr. Husari. Dr. John Azar opened an oncology office here. The first M. William Adler Charity Golf Tournament was held at Stonewall Resort to fund a health care scholarship. The Auxiliary donated a Patient Education system to SJMH. Long-time SJMH Board member Robert Earle retired from the Board to move to Charleston. John Spiker was named to the board as Earle's replacement. Orthopedist Dr. Joseph Snead's medical practice was acquired by SJMH. The first Christmas Craft Show was organized by the Soc/Rec Committee. A new department head position was created for the Hospital. A Physician Clinic Director would now take care of the medical offices affiliated with SJMH. Dr. John Thomas, a surgeon, joined the staff in April. SJMH became a Partner in Education with Jane Lew School. Dr. William Kelley joined the ED staff. Massage therapy and pulmonary rehabilitation were added to the Physical Therapy Department. John E. Law became the newest member of the SJMH Board of Directors. Dr. Pascasio retired from his practice in Weston. Dr. David Watson opened a new clinic in Jane Lew. Dr. Charles Lively was named Lews Countian of the Year by the Lewis County Chamber of Commerce. SJMH opened the Weston Pulmonary and Medical Clinic with Dr. Mahmoud and Dr. Zuriqat. Dr. Nabil Guirguis, nephrologist, joined the SJMH staff. Dr. Rob Snuffer started his family pracice. The Auxiliary bought a paging system for surgery. The Hospital passed the JCAHO survey. Another department was added to the Hospital. Information Technology (IT) was able to take care of many of the SJMH's computer needs within the hospital. Auxiliary President Nilva Posey passed away unexpectedly in February. Sue Clem was named Employee of the Year. A security door was added to the ED hallway for the maximum safety of SJMH staff, patients, and visitors. SJMH retiree Ronnah Godfrey passed away unexpectedly in March. Clean indoor air regulations took effect, prohibiting smoking within 15 feet of any SJMH entrance. Housekeeping Manager Patty Heath retired from SJMH. Housekeeper Donna Myers passed away in July. Urologist Dr. Peter Edgerton began seeing patients here. The PACS system in Radiology began operation. Dorothy Fisher, widow of Dr. Ralph Fisher passed away. The Pharmacy and Nursing Department began the implementation of a "Pyxsis" system for the departments to ensure the accurate delivery of medications to the patients. Auxiliary President Teresa Moran passed away unexpectedly in January. The Auxiliary presented the SJMH Special Delivery Center with chair/beds for each OB room. The American Cancer Society conducted a wellness survey for the Hospital. Mary Ellen Bragg was named Chief Nursing Officer. Jimmy Lattea was named Employee of the Year for the second time. Billie Harris, of SJMH's Materials Management Department and Lucille Hicks, of the Surgery Department, retired. Dr. Doug Tice joined the office of Dr. Snead at Weston Orthopedic and Sports Medicine Center. He began offering minimally invasive knee surgery. Dr. Charles Lively retired from his medical practice after serving Lewis County for 50 years in July and passed away on Dec. 16. Maintenance employee Nelson Riffle retired. Lithotripsy were added to SJMH's services. Roberta Gaines was named 2006 Employee of the Year. Denver Turner replaced the late Dr. Charles Lively on the SJMH Board of Directors. The Theresa Snaith Hospital Auxiliary donated bariactric equipment to SJMH. Dr. Peter Edgerton joined the medical staff on a full-time basis. Four employees retired this year including Nancy Moody, of Housekeeping; Beulah Ruppert, of the Emergency Department; Bob Mills, of the Emergency Department, and Joan Miller of Surgery. Two programs in nursing were implemented for Falls Prevention. A national company, Sodexo, became manager for SJMH facilities. A new medication verification program was implemented at SJMH. Dr. John Wyllie, of Weston Ear, Nose and Throat, opened his practice in May at the offices formerly occupied by Lively Healthcare Center. Dawn Bledsoe, joined the practice as the office's audiologist. Lively Health Care's office moved to a Jane Lew location. Stonewall Home Oxygen Therapy and Stonewall Home Care moved their offices to Market Place Mall. Two SJMH employees, Larry Gatian and Judy Roberts retired from the Hospital. Former staff members Martha Queen, Evelyn "Simmie" Simmons, Nick Linger, and Lois Lamb passed away. Former Board members Dr. Charles Wagner and Robert Earle passed away. Tammie Mick was named 2007 Employee of the Year. Three physicians began joined the medical staff - pulmonologist Dr. Naveen Akkina, rheumatologist Dr. Haritha Narla, and surgeon Dr. Ron Pearson. Doctors Jeremy Williams and Chris Kennedy started their medical practices at Lively Healthcare Center. Maintenance's Steve Butcher was named 2008 Employee of the Year. Ruth Ann Butcher, Ruth Ann Hefner, Harriett Williams, Irene Arbogast, LaDonna Sprouse, Fonda Teter and Cammie Posey retired from SJMH. Two former employees - Susie Stasel, of Lab, and Suzie Miller of the front console, passed away. Stonewall Home Oxygen Therapy received national accreditation for the company. Lab's Bob Thomas celebrated 50 years at SJMH. Dr. Peter Edgerton is now offering cryosurgery. Ronda Brown was named Employee of the Year. Three new physicians joined the SJMH Medical Staff. Sharrell Gibson, M.D., joined the offices of Mountaineer Healthcare for Women. Orthopedic surgeons Doyle R. Sickles, M.D., and Shafic Sraj, M.D., joined Joseph Snead., M.D., at Weston Orthopedics and Sports Medicine Center. Employees Linda Bush, Helen Dot Butler, and Sally Frazee retired from the Hospital. Dr. Haritha Narla and Dr. Nuveen Akkina left SJMH for Virginia Beach in early summer. Dr. John Thomas moved to West Virginia's eastern panhandle in September. Major renovations at Lively Healthcare were complete in August almost doubling the size of the facility at Jane Lew. Long-time administrator David D. Shaffer retires in December. Associate Administrator Avah Stalnaker takes over the helm. Dr. M. Kurdi, a pulmonolgist, and Dr. Waid McMillion joined the SJMH medical staff. Renovations continue at Stonewall Jackson Memorial Hospital with the revamping of the cafeteria. Patient rooms are also remodeled throughout the year. Kevin Stalnaker is named Chief Operating Officer. Dr. Paula Galloway joins the SJMH medical staff as a general surgeon. SJMH is named in the top 18% of Hospitals by Joint Commission. Weston Ear, Nose and Throat and Audiology moves to offices next to Stonewall Home Oxygen Therapy at Market Place Mall. Three new physicians join the SJMH staff - Dr. Brian Hornsby, internal medicine; Dr. Matthew Denti, OB/GYN; and Tyler Hall, family medicine. Long-time employee Rick Thomason is named 2012 Employee of the Year. A new generator is installed that will provide much better back up for Hospital needs in response to the derecho of June 2012 which left the hospital without power in important areas. The business office moves to the former offices of Weston ENT on Center Avenue and that area is turned into a new Oncology/Infusion/and Vein Center. The Annual Award Dinner was held on March 1 at Stonewall Resort. Jerry Wood was named employee of the year. The Hospital made a commitment to the children of the area with their collaborating with the City of Weston to create new playgrounds in the town. SJMH employee Connie Riffle and her husband renovated an old school playground into Polk Creek Community Park. SJMH employee Nastausha Hefner became project manager for a second proposed play area - Willow Street Playground, a natural playground. Physician Rob Snuffer was chosen as the Rural Healthcare Provider of the Year. SJMH was awarded the honor of "Employer of the Year" for the 12-county Department of Rehabilitation Region. Nurse practitioner Miral Gibson was selected as 2014 SJMH Employee of the Year. Physician Bryan Hornsby was chosen as the Rural Healthcare Provider of the Year. Amanda Rowan was chosen as the 2015 Employee of the Year. Dr. Rob Snuffer was selected as Lewis Countian of the Year; and CEO Avah Stalnaker was selected as Businesswoman of the Year by the Chamber of Commerce. The Hospital went "live" with the new Cerner electronic health records system at the beginning of November. The Physician Building ribbon cutting was held in Buckhannon on November 21. The office houses four of SJMH's physicians on a rotating basis. Mon Health system of Morgantown entered into a preliminary agreement with Stonewall Jackson Memorial Hospital. SJMH became affiliated with Mon Health on October 1. As part of the merger, it is expected that the two entities will begin plans for building a new Stonewall Jackson Memorial Hospital. Social Worker Brenda Weaver was named the 2016 Employe of the Year. Dr. Michael Hess joined the staff at Lively Healthcare in Jane Lew. Stonewall Jackson Memorial Hospital's affiliation with Mon Health is beginning to bring new opportunity for us. SJMH employees are working with Mon Health system employees in a number of areas to provide excellent care for patients. The Mon system adopted SJMH's value - ICARE. Dr. Rathina replaced Dr. Hornsby at the West Second Street location.